I have spent 80% of my time this week in class or doing homework. I’m not sure how I would have managed if I was actually working full-time. My accounting class is basically like taking a math class and we have online hw due almost every other day. And my online class you basically have to read and teach yourself. So far I’m still working on creating a list of everything I have to do but it’s hard sometimes esp living at home. I need to look into some Noise Cancelling Earphones. Last weekend was very busy. I went on a Pilgrimage that consisted of visiting several churches in our diocese and learning about the history of each parish. It was very interesting to learn how many of these parishes came to be. Then on Sunday my mom had to go to an adult confirmation 90 minutes away and she asked me to accompany her. Plus it was near a yummy pizza by the slice restaurant. I’ve slacked the past week on my #BoostYourBlog Challenge. This week they had some really cool topics. I’m hoping to maybe catch up on some of them in the next week or so. I also STILL have a TON of reviews to write!! AHHH. I’m hoping to start using Monday’s to play catch-up as on Monday’s my mom takes a class from 6-9 and she needs a ride there and back and her class is right outside the computer lab. Last Monday it was nice to sit there and not get interrupted by a million things. Earlier in the week I found these awesome videos based on the catechism on a website called VCat.org. It’s a 3 year project that started with the Year of Faith. Every month they release a different video. They are currently working on the Creed Section. Here is the video of the Overview of the Creed. You can also download it to your computer so we can use it in some of our catechism classes that don’t always have wi-fi capabilities. One of my 2013 goals is to write something AWESOME and have the post go “Viral”either on the internet,pinterest, or both. I’m not sure what exactly it’s going to be but I just think it would be cool. For those of you that are new to my blog last year I hosted a weekly link-up during Lent for everyone to link-up and get Meatless Meal ideas. It was called Lenten Meal Plan Monday. Liesl informed everyone that Lent is less than a MONTH AWAY!!! And I realized I needed to get started on my planning. Tales of Astoria participated in the link-up last year and asked if I was going to do it again this year and good news guys I am and she’s going to co-host with me!! I’ll work on a image and some instructions for everyone to participate in the next week or so. I loved hosting last year and can’t wait for it to start again this year! For more Quick Takes, visit Jen at Conversion Diary! And keep praying for her she’s still recuperating. 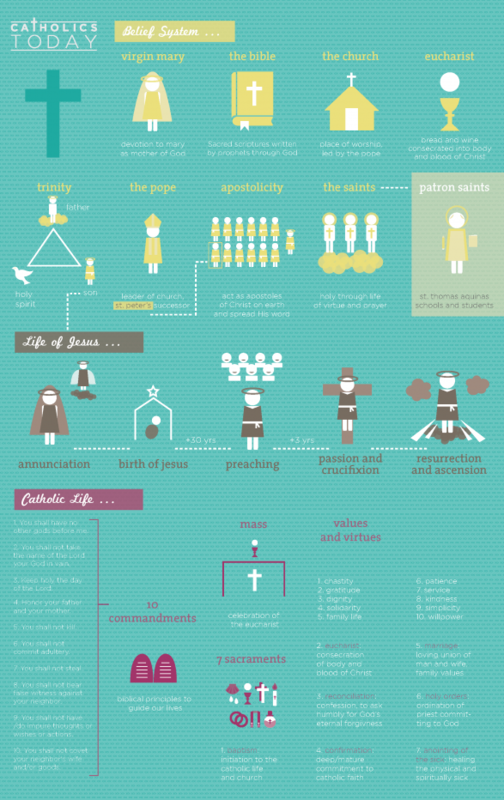 I love the Catholic infographic. I think I would laminate it and hand it out when people start acting like idiots about what the church teaches.